March is known to 'come in like a lion, and out like a lamb', but Muhsinah's interpretation of such a transitional month features more roar than bleat. Bold, caffeinated rhythms await in this short-but-sweet collective and it's a decent follow-up to Muhsinah's previous monthly installments, January and February. 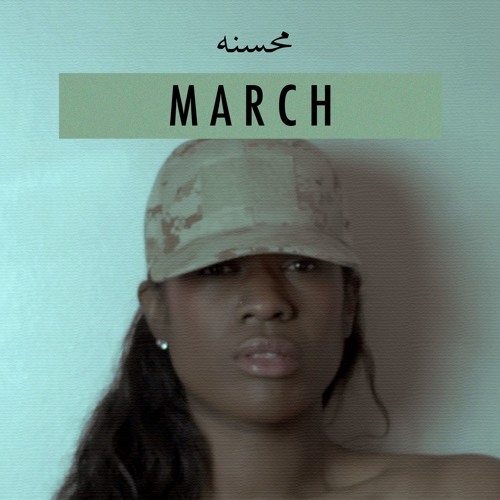 Really, don't be fooled by its size, March is heavy on the synth and percussive artillery that Muhsinah has been known to employ, and you're quite aware of this fact right from the get-go when things kick-off with a reprise of February's stand-out cut, "Gorgeous". Re-dubbed "Still Gorgeous" the mere 50-second track is remodeled and infused with weighty beats that bolster the song towards an 1980s state-of-mind. Following in similar stride, "Wake Up" springs into play on spiky waves of synths as Muhsinah declares to her slumbering beau-to-be that he needs to wake up to all the fly lovin' she is willing and able to give or she'll be out the door. "Dope" closes this third chapter with Muhsinah continuing to convince her lover she's the sure thing amid brisk slaps of snare drums and a trappish, jaunty beat. While this collection seems a little thrown-together and not as stimulating as its predecessors (sorry, it's a little 'meh' to me), there is fortunately still more to look forward too as 2016 keeps on keepin' and Muhsinah keeps on supplying her unique spins on electro-soul and all of its components.